Atacs 0575: PERFORATED FILM RELEASE « Atacs Products Inc. 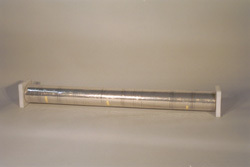 The Atacs 0575 is a high-temperature release film and perforated bleeder. It is a fluorinated ethylene prophylene copolymer. This clear perforated release film is primarily used as a bleeder in composites bonding and repair. It lends itself to readily overcome bridging in complex contour lay-ups. Atacs 0575 (clear) is ideal for composite lay-ups. because it shows up clearly against the laminate and can be easily removed.